OPPO Giveaway Alert: Win a Luxury Bag Worth Php70K When you Purchase a Brand New OPPO F5! OPPO Philippines is truly set to define a new generation of selfies with the new OPPO F5. 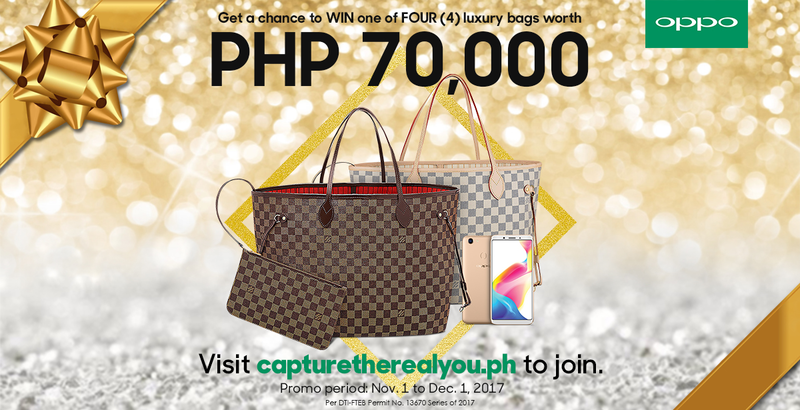 Following its record-breaking success of generating a total pre-order of 33,000 units in just seven days, OPPO is giving away four luxury bags worth Php70,000 this November until December 1, 2017. “OPPO highly appreciates the overwhelming support that we received from the F5 pre-orders. We have always been grateful for our fans’ continuous support and this is just one way for us to give back to them,” said Stephen Cheng, Brand Marketing Manager of OPPO Philippines. The F5 is OPPO’s latest selfie expert smartphone featuring a 6.0-inch full-screen FHD+ display device and facial unlock recognition. It is equipped with the first A.I. Beauty Recognition technology, designed to make selfies more natural-looking. The OPPO F5 is now available for Php15,990 at authorized OPPO dealers nationwide. Installment option is also available via Home Credit at 0% for 6 or 9 months payment plan.